Player-created empires, player-driven markets, and endless ways to embark on your personal sci-fi adventure. Conspire with thousands of others to bring the galaxy to its knees, or go it alone and carve your own niche in the massive EVE universe. Harvest, mine, manufacture or play the market. Travel whatever path you choose in the ultimate universe of boundless opportunity. 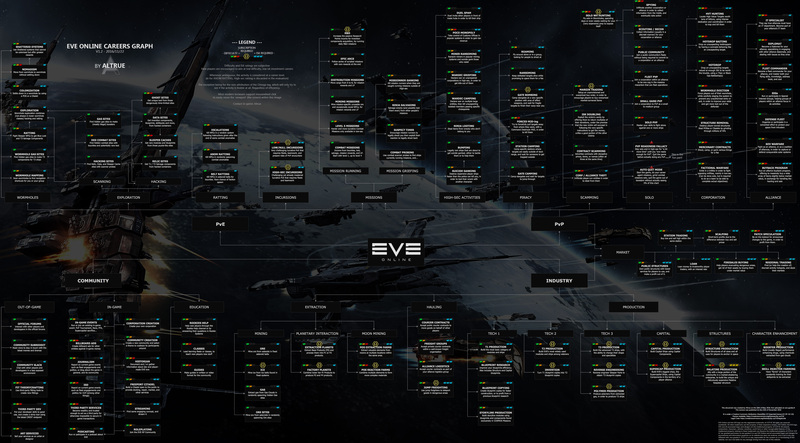 What can you do in EvE Online? How can I join you in EvE? I have been part of The Exchange Collective for a while now, good group of guys that will help out and teach anyone willing to learn. They are part of a huge alliance that owns a pocket of 0.0 Null Sec Space. You can join me and we can turn this into an epic space adventure. Still not Convinced? Check out this Amazing trailer put together by EvE and the community. Yup, I'm on it. This weekend Sir! (05-25-2017, 06:22 PM)ChippyMinton Wrote: Yup, I'm on it. This weekend Sir! Nice, do you like the intro? Should I add more stuff or? I think it's really good. Great to have the facts bullet pointed. I think you've got the right amount of info, any more and it starts heading into 'too much text to read' territory.